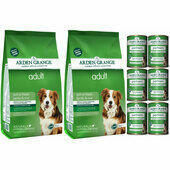 Our Arden Grange Dry Dog Food Multipacks are available in 13 different flavours and will help you save money whilst making sure that your dog is eating a healthy, nutritionally balanced diet. 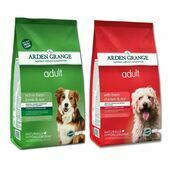 A best selling Arden Grange dog food made using human-grade lamb. Perfect for dogs that are usually fussy when it comes to what they will eat, this dry dog food contains all of the essential minerals and vitamins that your dog will need. Containing 24% pork and 26% rice, this dry adult dog food is rich in protein, zinc selenium and B vitamins. Free from egg and maize, this dog food also contains sweet potato, which is high in vitamin B6 and dietary fibre. 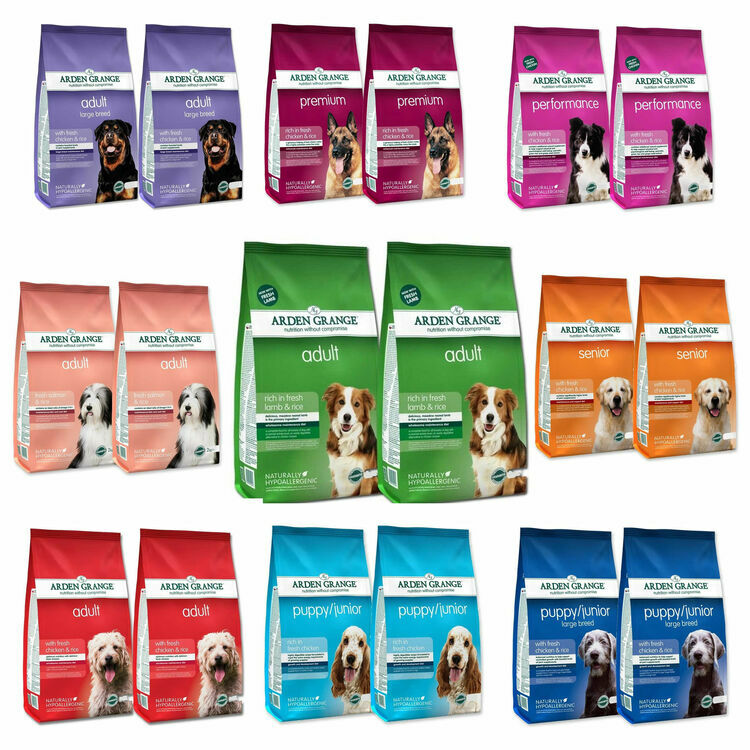 Designed for dogs that are entering their golden years, this dry dog food has been formulated for small breed dogs over the age of 10, as well as medium and large breed dogs over the age of 8. 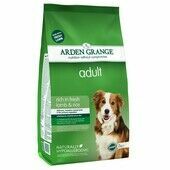 Low in fat and nutritionally balanced, this Arden Grange dog food contains added ingredients to aid older joints. 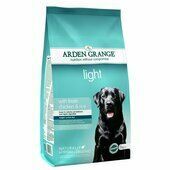 Perfect for dogs that are a little overweight or are recovering from an injury and are therefore less active, this light adult dog food from Arden Grange is low in calories, rich in fibre, and contains chicken as its main source of protein. Rich in Omegas 3 and 6, antioxidants, glucosamine, chondroitin and MSM, this dry dog food is perfect for dogs with a discerning palate. 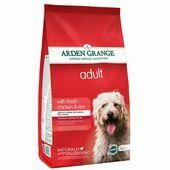 Ethically produced, as all Arden Grange dog foods are, the minimum chicken content in each bag is 38%. Free from corn and maize, this dry dog food is free from artificial colours, flavours, preservative and any other ingredient that might irritate the digestive system or cause unpleasant skin conditions. Ideal for dogs that need to add weight quickly. 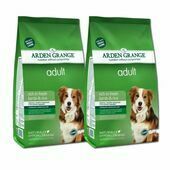 Made using delicious high-quality fresh chicken, this Arden Grange food is ideal for dogs with dietary intolerances and allergies. Suitable for active adult and working dogs, this high-performance dog food is highly palatable to ensure that every morsel shall be eaten up. Containing fresh, Grade-A chicken protein, this dry dog food contains high concentrations of Omega fatty acids 3 and 6, as well as other antioxidants and vitamins. Formulated for large and giant breed, this dog food provides everything necessary for maintaining a healthy lifestyle. 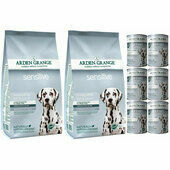 Formulated using ingredients that are certain to provide optimal digestion for dogs with overly sensitive skin and stomachs, Arden Grange Sensitive also contains cranberry extract which will help to maintain the health of the urinary tract. 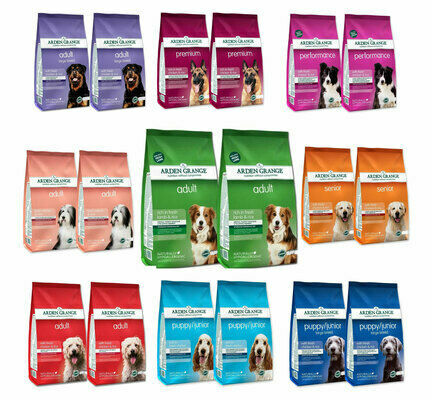 This dog food is completely free from cereals, grain and gluten. 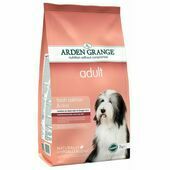 Created using fresh salmon & wholegrain rice, this Arden Grange dog food is free from wheat, gluten, dairy, beef & soya, making it perfect for dogs with digestive difficulties, allergies or irritating skin conditions. Delicious and nutritionally balanced, this dry adult dog food contains at least 26% salmon and 26% rice. Made using high quality, non-battery farmed chicken, this dry dog food is rich in protein and provides dogs with ample amounts of energy. Complete with medium-sized kibble that has been designed to suit most dog breeds, the chicken content of this dog food is never less than 32%. 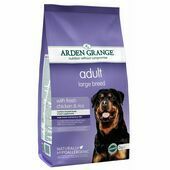 Created specifically for large and giant breed dogs, this dry dog food from Arden Grange contains the level of nutrients that young dogs require for optimum growth and skeletal development. Suitable for puppies over 2 months old, this chicken and rice dog food can be easily digested and helps to support the immune system. Containing natural preservatives such as mixed tocopherols & rosemary extract, this junior dog food has been designed for puppies less than one year old. With a minimum chicken & rice content of 50%, this dog food supports the development of the immune system and encourages healthy digestion. Our 2 G S D s thrive on it. Our 2 GSDs look in fabulous condition on it. Now our two dogs are classed as elderly we have changed from the adult Arden Grange to the Senior Range. Our dogs love this kibble and is perfect keeping them healthy inside and their skin and coat outside too.